In Which the Pirate Has More Success. After the complete failure in every way of my attempt at tuck lace, I decided to go back to fair isle and make... something. A wrap? a scarf? A very large swatch? Whatever. 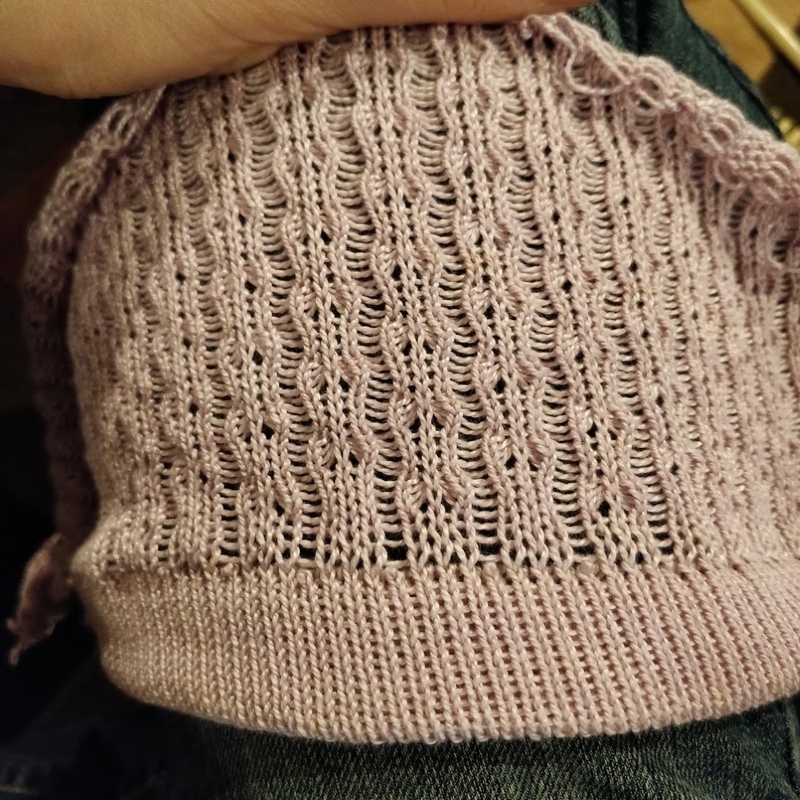 I picked out some of the coned cotton that Dawn gave me and cast on, and before I knew it, I had 300+ rows of error-free (if a little loose) knitting. It didn't take long for me to decide that this cotton is too heavy to be a good scarf, this piece isn't wide enough to make a comfy wrap, and therefore I should put buttonholes in the second hem and make it into a pillow cover. So I guess I'm going to learn to make buttonholes! Mom has a multi-generational button box, and I bet I can find something quirky and cute to use. The real trick is going to be deciding which ones, I'm sure. My new machine didn't come with an instruction manual (I knew that before I bought it.) The book's available as a scanned pdf online, but I was getting frustrated at trying to flip back and forth between pages, so I bought a used copy and I can already tell that it will be helpful. I also found a pdf version of a book called "Brother Knitting Techniques," which is currently open to a set of pages with instructions on how to make buttonholes several different ways. 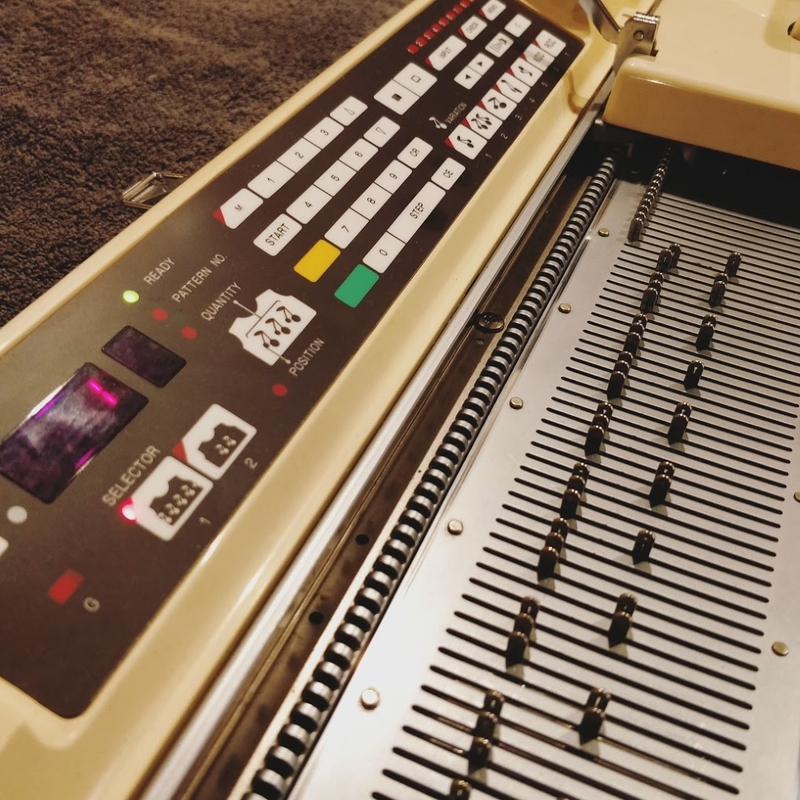 In Which the Pirate Acquires Another Knitting Machine. So... 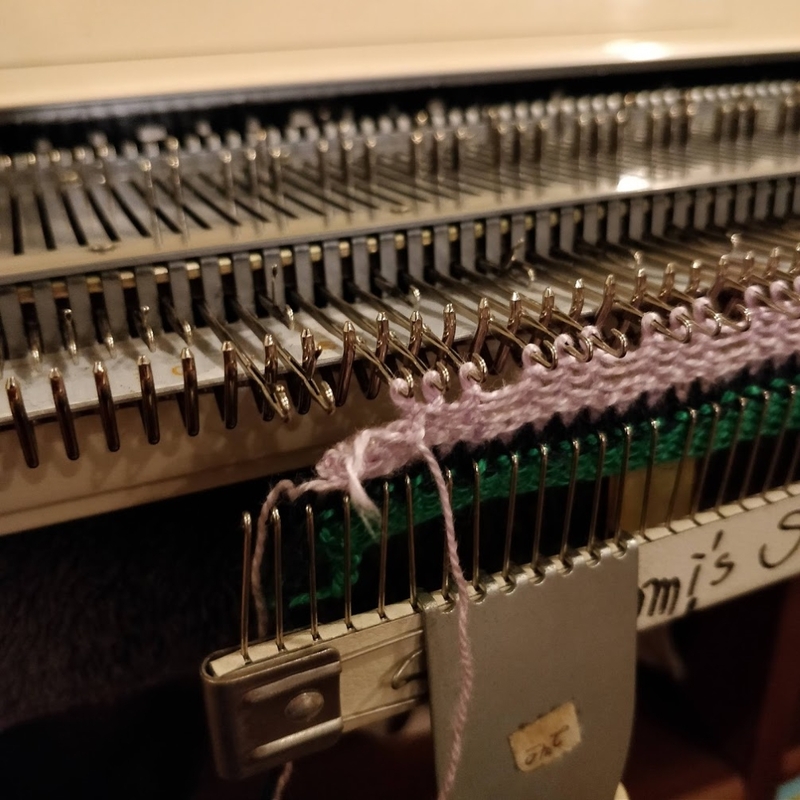 I got it into my head that I wanted a newer knitting machine - one of the standard gauge ones with bells, whistles, and electronic innards that can be connected to a computer. By "newer," I don't mean anything like "new," because the model I was looking for was made in the late 80s/early 90s. These nearly 30-year-old machines are still cranking right along. It's pretty amazing to see what some people have done with them: check out img2track and this awe-inspiring star tapestry! 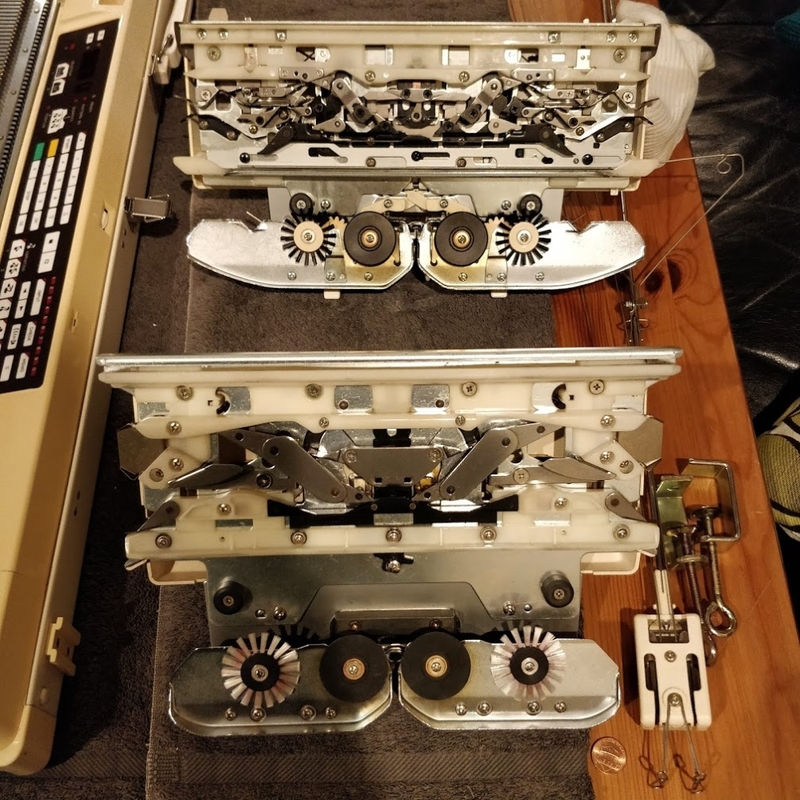 After a good deal of research and looking on eBay and Etsy, I found a Brother KH-940 (well, a KnitKing Compuknit IV, which is exactly the same thing with a different label) for a good price and bought it. Of course, getting something for a good deal often means getting something that needs a little fixing up, and that's pretty much what happened. When I got the machine, it was covered in fine brown fuzzy bits, and the case took a little damage in shipping, but the electronics tested out just fine. The needles were clean and the sponge bar new (whew) but the centre buttons on the carriage were immobile - which is a pretty common issue, as the grease hardens with age, and that was a fine excuse to go shopping and get some more appropriate cleaners and lubricants than what I had in my garage already. It took me about a week of evenings to get it all cleaned up and knitting smoothly. Then, of course, I had to make some swatches. 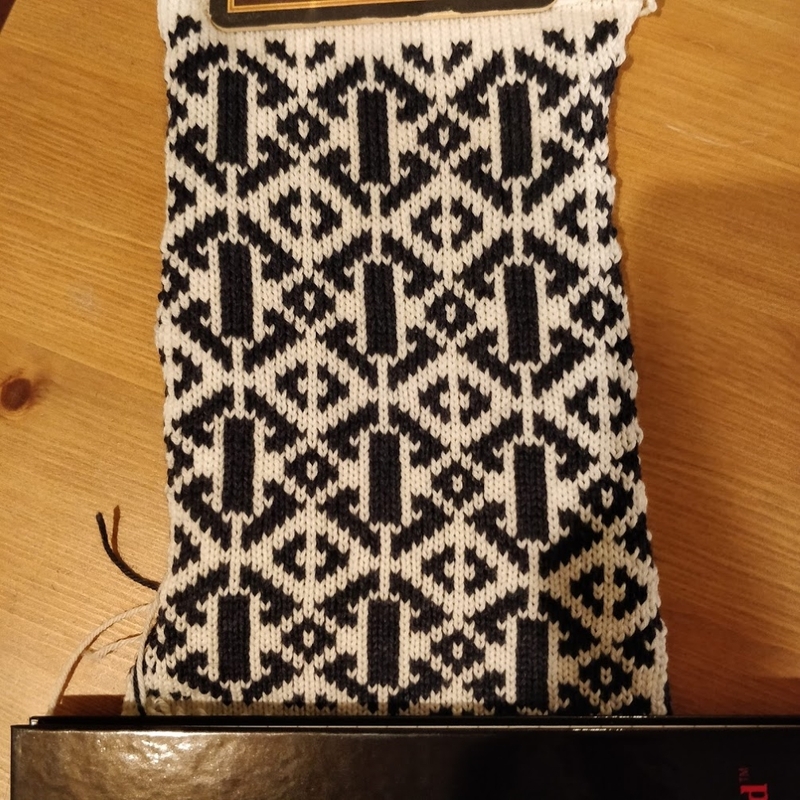 First I tried fair isle, and it was like magic. 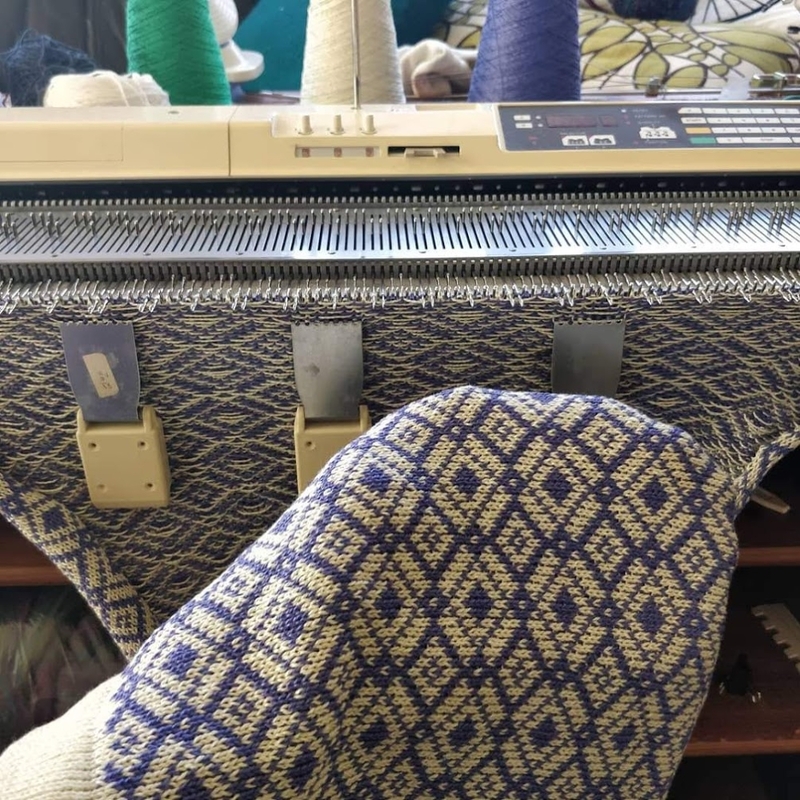 The carriage holds both yarns at once and automatically knits colour A onto some needles, colour B onto others. 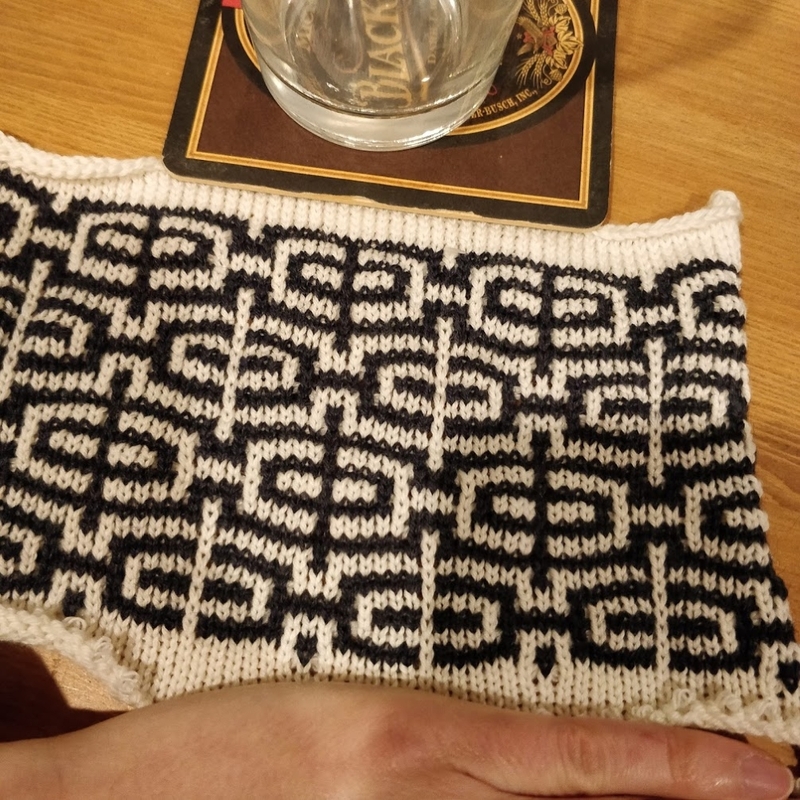 There are a bunch of patterns pre-programmed into the machine, so I picked number 40 at semi-random and made up this small swatch using leftover sock yarn. So third, I decided to try a one-colour tuck lace with some of the coned cotton that I have, and when I accidentally dropped the whole piece off the needles I decided that I liked the pattern well enough to attempt a wrap/shawl sort of thing with it. Whooooboy, this was the cursed piece of knitting. Not that there was anything wrong with the yarn or with the machine; everything was entirely user error.